That was producer Walter Wanger’s verdict on Hitchcock, producing FOREIGN CORRESPONDENT, his second American film and his first made out from under the thumb of David O Selznick. “I’ve seen him climb a ladder with unbelievable agility,” he added — a startling image. This is all from Bill Krohn’s excellent book Hitchcock at Work. 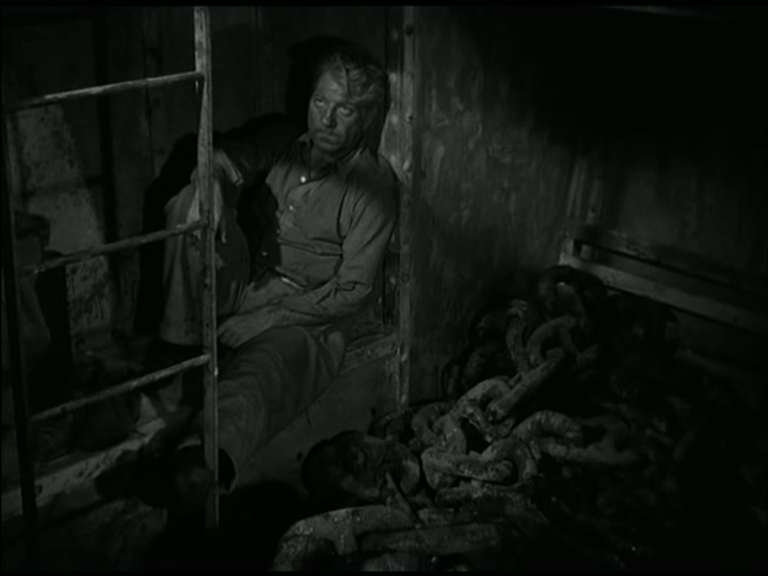 Star Joel McCrea had a different impression, as he saw Hitchcock slumbering between, and even during takes. “Cut!” he cried, as his director snored. Hitch awoke. “How was it?” “Best in the picture!” declared McCrea. “Print it!” said Hitch, quite satisfied. Hitch was a little snooty about McCrea when talking to Truffaut. The French auteur remarked that, compared to the gloss of REBECCA, FOREIGN CORRESPONDENT was very much in the B movie mold, and Hitch blamed the casting. He had tried to secure the services of Gary Cooper, who considered the thriller romp beneath him and turned it down (Hitch had written an article for the English press about the American stars he’d like to work with, and Coop was one of them. William Powell was another. Carole Lombard was the only one named whom he got to direct, and that in a rather unsatisfactory film — see next week for details). Really, I think Truffaut was referring to the movie’s helter-skelter plotting and structure. In reality, it cost more than REBECCA, what with its extremely elaborate production design and effects work by William Cameron Menzies (who also designed GONE WITH THE WIND). McCrea, an actor of true modesty, once expressed himself amazed when Preston Sturges wanted to hire him. 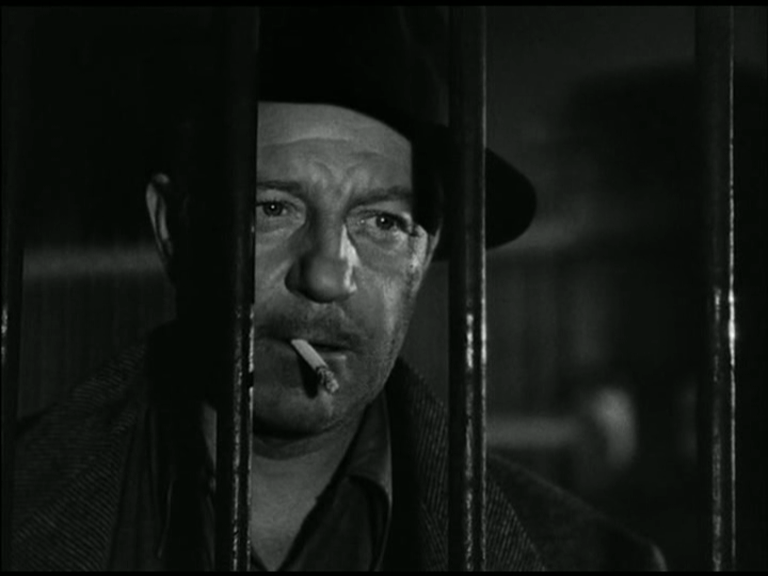 “I want you,” said Sturges. “People don’t want me,” protested McCrea. “They want Gary Cooper and they get me.” I think Hitchcock should have been damned grateful to have a generous and warm player like McCrea on his team. Starting from the memoirs of a real-life foreign correspondent in Europe, Hitch roped in British collaborator Charles Bennett for one more screenplay, working with Joan Harrison, who had worked her way up from secretary to the most important part of the Hitchcock support group next to Alma. The writing credits are complex: Robert Benchley contributed to dialogue as well as co-starring, with James Hilton and, for the stirring final speech, Ben Hecht, a writer who would loom large in Hitch’s future work. Part of the impulse was certainly propagandist, to encourage America to enter the war in support of Britain, and the other goal was to create a true Hitchcock vehicle, a chase film like THE 39 STEPS, the sub-genre Charles Bennett had helped invent. Once Holland was fixed upon as a setting, Hitch asked the familiar question: “What do they have in Holland?” and set-pieces immediately began to take place. We begin in a miniature New York, moving from the general to the specific in classic Hitch mode, into a newspaper office, where the editor is looking for news from Europe, and is sick of the guff he’s getting from political correspondents. He decides a straight crime reporter would be better: “There’s a crime happening on that bedeviled continent!” This is a classic Hitchcockian ruse, since the director hated to have an expert hero. In all his best espionage films, the protagonist is a naif thrust unwittingly into trouble. If he must be a professional, let him be inexperienced. John Gielgud in SECRET AGENT was an author newly recruited to the service. Robert Donat in THE 39 STEPS was a complete outsider. The cop heroes of BLACKMAIL and SABOTAGE are marginalised next to the heroines. So McCrea’s John Jones is a man who knows nothing of politics and is armed only with common sense and an athletic build. Starting with his head in the ground, he will undergo a political awakening commensurate with that Hitchcock hopes for from his audience. The ed sends McCrea to get the inside dope from a statesman called Van Meer. “How about Hitler? Don’t you think it’d be a good idea to pump him? He must have something on his mind.” For no very credible reason, John Jones is rechristened Huntley Haverstock and introduced to peacemonger Herbert Marshall. A brief scene of McCrea saying goodbye to his relatives before sailing adds comparatively little, except to suggest what Hitchcock’s emigration to America might have been like, with a bossy mother becoming emotional at the last moment… In reality, the poor cameraman dispatched by Hitch to shoot second unit in England and Holland was torpedoed on his way home, and had to make a return trip for retakes. McCrea makes contact with Van Meer (Albert Basserman), which is a plot point rather than a chance for discourse: Hitch and Bennett’s political thrillers always avoid any real discussion of politics — the trick is to express politics in movement. McCrea tries to talk war, but Basserman rambles on about feeding the birds. “Don’t you think that right now the birds are the least of our worries?” asks the frustrated reporter. Hitch seems to be trying to prefigure all his later movies. At a peace reception conference thing, we meet Herbert Marshall’s screen daughter, leading lady Laraine Day, whom Hitch was equally sniffy about. While she may add to the air of B-movie, not being terribly famous, she does a fine English accent for a gal from Utah, and is personable enough. McCrea and Day meet and spar, and there’s a comedy Latvian and a comedy Scotsman and a comedy society matron, &c. McCrea endears himself to us by putting his foot in it with Laraine. Off to Holland, spurred on by a convenient telegram from the editor. The cast are reunited in a gigantic town square constructed at vast expense. Michael Balcon had refused to let Hitchcock build (and blow up) a tram for SABOTAGE, so Hitch makes sure he has several here. Some idea that Holland is perpetually rainy leads to the upcoming set-piece with umbrellas, for 25 minutes in the film is suddenly going to become a thriller. First, Van Meer doesn’t recognise McCrea — THE LADY VANISHES moment when reality assumes the mask of nightmare — and then VM’s bloodily done in by a fake news photographer, who hides a revolver alongside his camera in a visualised pun on the verb “to shoot.” The flowing moves of the scene are interrupted by the quick, unnaturally static shots of the gun-blast and camera-flash (POV Van Meer) and the slain man’s face, frozen pain/death (POV killer). A classic Hitchcock “God shot” shows McCrea chasing the culprit through a forest of brollies, and then dodging through traffic as every stray shot from the gunman seems to fell an innocent bloke on a bike. I haven’t seen so many Dutch cyclists abused since SPETTERS. Jumping into a passing car, Our Joel finds himself in a high-speed chase with Laraine Day and George Sanders. George frickin’ Sanders! Nobody’s that lucky. George quickly offers up the best line of dialogue ever delivered in a high-speed chase: “I say old girl, would you mind shoving your knees out of the way?” Sanders is Scott ffolliott, a delightful Charles Bennett creation. I’m not sure why ffolliott’s needed in this story, but I’m of course overjoyed to have him. He seems designed to soak up bits of action and adventure that should rightfully belong to the hero or heroine, but since the sight of George Sanders leaping out of windows and crashing through awnings has a whimsical incongruity to it that Joel McCrea could never attain, I can’t regret the substitution. “Inside the sinister windmill,” is the answer, and the real Van Meer is there too — that’s why the assassinated statesman didn’t recognise Joel, he was a looky-likey. But — but — but — why didn’t he, as a professional impersonator, simply pretend to recognise McCrea? Why would the enemy shoot their own man? Wouldn’t somebody notice such a substitution, especially the coroner? Really great suspense stuff with McCrea hiding from the bad guys. Van Meer has been conveniently drugged so he can’t explain the plot (I would think drugs might help). The windmill, tiny on the outside, is cavernous on the inside, and then McCrea has to dangle from the roof to avoid capture, it’s suddenly very tall also. The birds come to his rescue by providing an alibi for his noises. The bad guys then have to manhandle a drugged old man down narrow stairs without banisters — their plans look sure to go awry in absurd fashion. Fetching the authorities (with the help of the world’s least convincing Dutch schoolgirl) McCrea finds all evidence has vanished, and he’s left looking like a chump. It’s a familiar thriller twist, of the kind Hitchcock pioneered in THE LADY VANISHES, but it means the plot needs kick-starting out of this cul-de-sac. An attack on McCrea in his hotel provides the necessary impetus, forcing our hero out the window in his dressing gown, where he must clamber over a giant “H” in the hotel’s sign (Hitch’s signature?). McCrea is often to be found in his bedclothes: an earlier scene shows him fetishistically garbed in PJs and bowler hat, while sharp-eyed observers of THE PALM BEACH STORY claim to be able to spot, er, Little Joel briefly escaping from the actor’s pyjama flies, if pyjamas can be said to have flies. McCrea’s interference with the neon converts the sign from HOTEL EUROPE to HOT EUROPE, a fitting summation of the political mood. Emerging in Laraine’s room in a state of dishabille, McC causes scandal and offence, but soon wins her over and battles the (very slow-witted) thugs waiting in his suite by calling room service. Laraine even send the valet to collect McC’s clothes by telling him “You see, my husband’s waiting in that room,” a re-use of the adultery story deployed by Robert Donat in THE 39 STEPS. Soon the would-be assassins are knee-deep in hotel services in a slight reprise of the stateroom scene in A NIGHT AT THE OPERA. International espionage has been mated with bedroom farce. London! Why? Doesn’t seem to matter. I think there is a reason but we’re going too fast to ask questions. 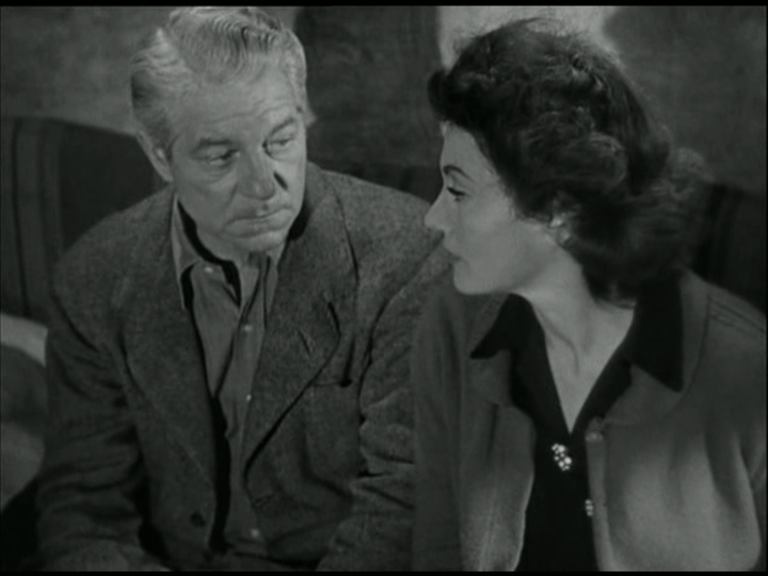 Edmund Gwenn, one of the few stars of English Hitchcock to migrate into American Hitchcock (he will return as late as THE TROUBLE WITH HARRY, to wonderful effect) makes an unlikely assassin, and quite an ineffective one, as it turns out. Hitchcock is onto something cute with the idea of the mild-mannered old boy who’s really a deadly hitman, but to pay the gag off correctly we would need to see him do something successfully nasty. But we now know that the heroine’s dad, Herbert Marshall, is in league with the baddies, so there’s a more compelling source of suspense. The conflict of family and faction make some form of tragedy inevitable. Leading Joel up a Roman Catholic cathedral tower, ostensibly to avoid the liturgy (“The dead are alright… in their place,”) Gwenn threatens to get Hitchcock in trouble again by jeopardising a schoolboy, but soon turns his lethal attentions to McC, with results that Hitch cheekily conceals from us for a few moments. Then we have a few moments of reporters McCrea, Sanders and Benchley in an office that makes me long for a sitcom about the three of them. Benchley answers the phone: “No, tell him it’s ridiculous!” He hangs up. Presumably that was Charles Bennett on the other end. The need to expose Herbert Marshall leads McCrea to take part in a fake kidnapping of Laraine Day, getting us into more ethically and emotionally murky waters than would generally be the case in the British comedy-thrillers. Fortunately for Hitch, McCrea’s sweetness is more than enough to keep us on his side. When McCrea hears that the plan requires him to keep Day busy all night, his honourable distress is more heartwarming than amusing. At the country hotel where he attempts to put this plan into action, the receptionist is the creepy-looking Eily Malyon, who played a Nazi agent in CONFESSIONS OF A NAZI SPY. Joel could be in trouble here! When Sanders tells Marshall his daughter’s been kidnapped, cinematographer Rudolph Maté pulls off his best, moodiest work in the picture so far, which is starker and simpler in its lighting than the baroque REBECCA. 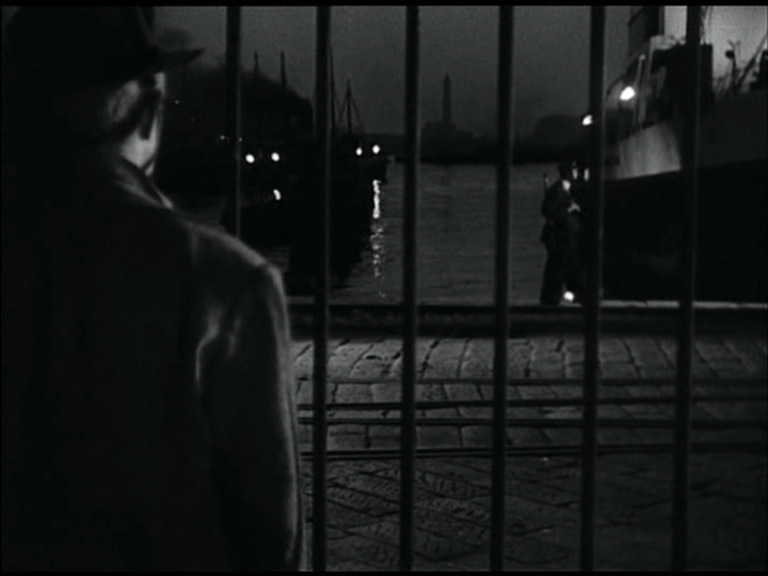 Hitch even has Marshall look almost directly into the lens, Ozu-style, a technique he had played with as early as THE MANXMAN, and which Selznick would object to when he did it in THE PARADINE CASE. As a protective father with a young daughter, Hitchcock no doubt identified with his villain here. Laraine Day, returning after romantic difficulties with McCrea, scuppers the fake kidnapping, but Sanders follows Herbert Marshall to darkest Tottenham Court Road where the kidnapped Van Meer is being tortured with bright lights and jazz music. Even better darkly modulated lighting from Maté, and then a brilliantly peculiar special effect from William Cameron Menzies as Sanders leaps from the window: a manikin ffolliott descends the front wall on some kind of hidden rail, hits an awning, which tears, and a felsh-and-blood ffolliott emerges, dripping wet, onto the street. Marvelous. “Ring up the Curzon Dancing Academy and cancel my rhumba lesson!” Great as McCrea is, I’m beginning to wish Sanders was the lead. Van Meer is rescued so that Albert Basserman can go on to appear in THE RED SHOES, but Scotland Yard is unable to arrest Herbert Marshall, so as war is declared, “weather permitting,” he takes off for America with his unsuspecting daughter. Hitch was very proud of his one-shot plane crash effect (in reality devised by Menzies, I suspect), but never talked about the astounding shot that creeps through the stratosphere towards the Transoceanic flying boat, sidles up to a window, eases itself through the glass without breaking it, and explores the first class cabin at its leisure. A remarkable thing. Of course, McCrea is aboard too, and just when the emotions are getting truly entangled, Hitch and Bennett pull the same stunt they tried in SECRET AGENT, only the deus is even more ex machina this time: a gunship blows everybody out of the sky and Hitch gets some aquatic practice in for LIFEBOAT, with a spectacular apparatus built by Menzies: a floating aeroplane with a wing that breaks off and drifts away, all built on underwater tracks like one of the toy trains Hitch loves. All the disaster movie stuff is terribly well done, and resonant to myself, since I recently flew the Atlantic by Air France shortly before one of their flights took a nose-dive into the drink. Disconcerting. rescue comes, but not before Herbert Marshall has sacrificed himself to save the others, providing redemption and a reunion for the lovers. Then it’s swiftly on to McCrea’s rousing propaganda speech, and end titles. So impressed was Walter Wanger with Hitch’s aeroplane work that he got him in to helm reshoots on Archie Mayo’s HOUSE ACROSS THE BAY, which had a passenger plane scene in it. I’ll try to see that one soon. FOREIGN CORRESPONDENT is a worthy climax to Charles Bennett’s work with Hitch, and would be the unsurpassed comedy-chase-thriller until NORTH BY NORTHWEST (SABOTEUR looks a little pallid by comparison). Bennett’s tendency towards bagginess in construction works as an effective disguise for some genuinely tight plotting — it’s not wholly consistent but it’s almost wholly enjoyable. Leonard Leff, author of Hitchcock & Selznick, wants us to believe that Hitchcock needed Selznick in order to make more mature films, and that FOREIGN CORRESPONDENT proves this. On the contrary, I think SHADOW OF A DOUBT disproves it, and FOREIGN CORRESPONDENT is too sophisticated an entertainment to argue for Hitch’s dependence on anybody. A pity Hitch didn’t work with Wanger, a really talented and supportive producer, some more.